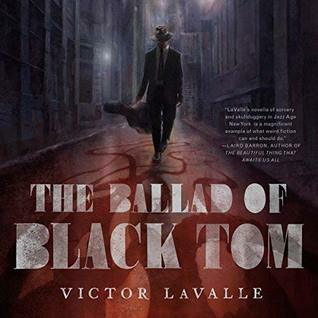 I borrowed an audio copy of The Ballad of Black Tom (by Victor LaValle) from my local library. Charles Thomas Tester hustles to put food on the table, keep the roof over his father’s head, from Harlem to Flushing Meadows to Red Hook. He knows what magic a suit can cast, the invisibility a guitar case can provide, and the curse written on his black skin that attracts the eye of wealthy white folks and their trained cops. But when he delivers an occult page to a reclusive sorceress in the heart of Queens, Tom opens a door to a deeper realm of magic, and earns the attention of things best left sleeping. This entry was posted in books/book review and tagged audio book, book review, horror, lovecraftian on February 11, 2019 by Sadie.